Keeping your dog cooped up indoors is no good. Outdoor play is important in ensuring that your pet gets the exercise he needs plus fresh air and sunshine. Your pet would probably love nothing more than to run around unhindered, but it’s also crucial that you keep him safe outdoors. This is where a fence system – like a wireless dog fence – comes in handy. What is a wireless fence system? What about a semi-wireless dog fence? Why do you need to have a wireless dog fence in place? When is a wireless dog fence not ideal? Is an electric dog fence easy to install? What type of invisible dog fence system is ideal for you? 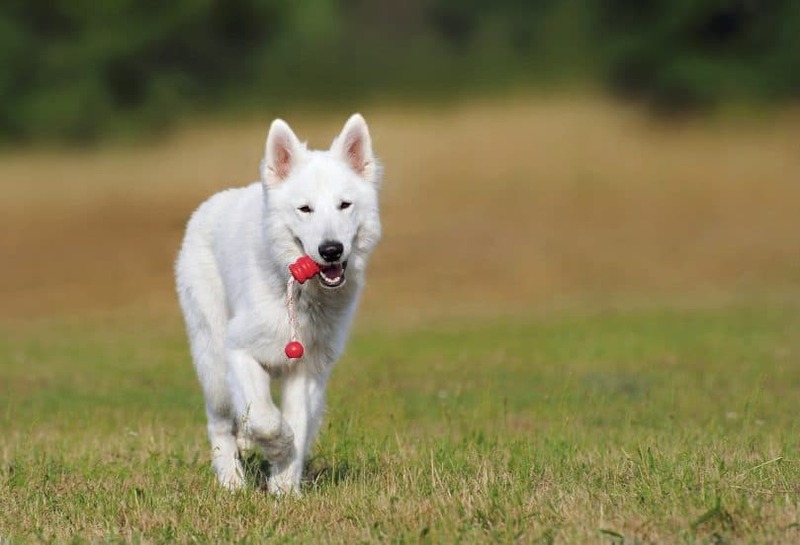 Also known as an invisible dog fence or a GPS dog fence, this wireless system is a safe and simple means to keep your pet contained within your property. The system gives your dog the freedom of being out in the open without all the risks, like getting run over by vehicles on the road. This type of fence comprises a transmitter, a dog collar with a receiver attached to it, and flags for marking boundary lines. The transmitter is designed to cover a circular containment area. The transmitter constantly sends a signal to the receiver, and when your pet approaches the perimeter of the containment area, the signal is lost and the collar emits a warning sound. If the beep doesn’t deter your pet, it will receive some static correction, a mild buzz against its skin to interrupt its behavior. Semi-wireless dog fences are also popular among pet owners these days. The main difference between a wireless dog fence and a semi-wireless dog fence is that the latter includes electrical wiring, which you can bury in the ground or keep above ground, to send signals from the transmitter to the receiver. A semi-wireless dog fence gives you more options when it comes to setting boundaries, as you’re not limited to a circular coverage. As long as you keep the corners rounded, you can place the wiring in a rectangular layout. 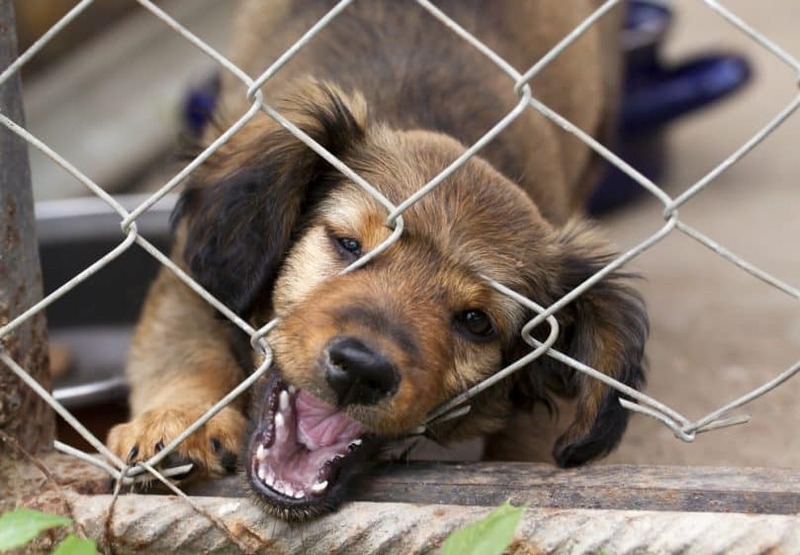 The most important reason why you need to have a fence system in place is to protect your beloved pet. With the best wireless dog fence around your property, you can rest assured that your dog is safe from hazards such as vehicles and local wildlife. An invisible dog fence will also keep your canine pal from getting into all sorts of trouble – he won’t be rummaging around in your trash, pestering the neighbors, or chasing squirrels and stray cats. Even better, your female dog won’t suddenly come home pregnant and you won’t have to deal with a surprise litter of puppies. Another benefit of using GPS dog fences is that there is no physical fencing structure, so it won’t block the view from your windows. You don’t have to worry about your house’s appearance getting ruined by an unsightly fence made of wood or chains. The best wireless dog fence comes at a reasonable cost and is relatively easy to install. Putting this fence around your yard won’t even cost you a penny. If your neighborhood or city has laws that prevent you from putting up fencing, an invisible dog fence is a good solution to protecting your dog without getting into trouble. These fencing systems come with multiple settings, so you can customize your fence’s features according to your dog’s size and behavior. Going camping or moving to a new home? You can pack up your electric dog fence and take it with you. Of course, invisible dog fences have their limitations, too. GPS dog fences are dependent on the environment they’re placed in. The fences are most effective when used on wide-open, flat spaces, where there are few obstructions between the transmitter and the receiver on the dog’s collar. You may find that the performance of even the best wireless dog fence will fluctuate if trees, bushes, and uneven terrain block signals from the transmitter. This may prove to be a problem if you have a landscaped yard. This fencing system works best if placed in a circular setup or, for semi-wireless dog fence, a layout with rounded corners. You may find it difficult to find a layout that works for you if you have an irregularly-shaped yard or if you live very close to your neighbors. And while an electric fence keeps your dog in, it doesn’t keep other animals out. If you have a small dog and you live in an area with plenty of wildlife, like coyotes, you want to think twice about installing an invisible fence. Don’t worry about the static correction hurt your dog. The stimulation is completely harmless, but it will get your dog’s attention. As we’ve said previously, you can customize the stimulation level so it’s suitable for your dog’s size, breed, and personality. One of the biggest advantages of using a wireless fence is its convenient installation. 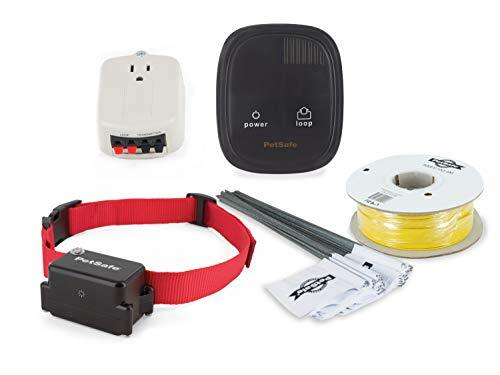 The fully wireless dog fence comes with three main components: electric wiring, a transmitter, and a dog collar with a receiver attached to it. You can install the entire system within a day by following these simple steps and tips. Setting up a fully wireless dog fence is easy. The tricky part is finding the right location for the transmitter. The transmitter should be next to an outer wall, with as few obstacles as possible between the wall and your yard. Place the transmitter away from large metal appliances and between 3 and 5 feet off the ground. With the transmitter in place, you can activate the receiver on the collar and set the radius of the containment area. Most wireless dog fences allow you to choose from various settings so you can customize the containment area according to your yard’s size. Once the containment area is set, you can start placing marker flags along its perimeter. Approach the area’s boundaries and plant a flag in front of your feet once you hear the collar beep. Repeat this around the perimeter of the containment area, with flags spaced 7 to 10 feet from each other. A semi-wireless fence may take a little longer to install because you need to bury the electrical wiring underground. Get some graph paper and draw your yard. Plot the area you want to cover. Make sure to keep the corners rounded to prevent interference. Put the transmitter somewhere inside your home. The garage is usually a great place for the transmitter, since it’s away from sources of electrical interference, like breakers and appliances. Go out into your yard and place marker flags along the perimeter of where you plan to install the fence. Lay the wire as straight as you can along the flags. Keep in mind that the wire must circle back to the transmitter. Test the electric dog fence by connecting both ends of the wire to the transmitter and turning the transmitter on. With the dog collar in hand, walk over to the wire in a few locations. You should hear a beep when you get close to the boundary. Along the flags, dig a trench 3 to 12 inches deep and just wide enough to lay the wire in. Once the wiring is in the ground, cover the trench with dirt. With the wiring underground, test the invisible dog fence again. Once everything works, you can start training your dog. Ground the transmitter. By keeping the wireless dog fence separate from sources of electrical interference, you can keep the system safe from damage. Most of the best wireless dog fences have user manuals that detail the grounding process. Use a surge protector. This fence system is susceptible to power surges, whether from lightning strikes or AC surges caused by your house’s power mains. A surge protector ensures that the fence stays activated even through these surges. Keep wiring above ground if you don’t want to dig into your yard. The wiring doesn’t have to be buried underground to work. Make sure to keep the wiring as close to the ground as possible to avoid people tripping over it or accidentally cutting it with a lawnmower. The best wireless dog fence hardly requires any maintenance. As long as the system is grounded properly, there’s no need to replace, repair, or repaint this dog fence. This saves you a significant amount of time and effort. The only thing you need to do to keep this fencing system working properly is replace the batteries on your dog’s collar and the transmitter when needed. Batteries typically last through 2 to 3 months of use before requiring replacement. Most collars that come with these fences have low-battery indicators for your convenience. The best wireless dog fence for your home largely depends on your needs and your environment. If you’d like to keep your dog safe while he’s playing in the backyard, then an outdoor wireless dog fence is for you. An electric dog fence that’s for outdoor use typically has a larger coverage compared to indoor wireless dog fences. You’ll also find a wide variety of outdoor wireless dog fences. Some of these invisible fencing systems offer multiple acres’ worth of coverage, so you can use them as a wireless dog fence for a farm and other large properties. Many of these outdoor fences are also designed for uneven terrain, so you can easily find the best wireless dog fence for sloped yards or even wireless dog fences for hills. Semi-wireless dog fences are particularly useful for yards that are not completely flat. An indoor wireless dog fence, on the other hand, is designed to keep your pet from going into certain areas of your home. These indoor fences work great if you want to stop your dog from entering the kitchen or your bedroom, for instance, but don’t want to restrict him through a cage or crate. The best wireless fences for indoor use are fully wireless for your convenience. As we’ve discussed before, the biggest difference between a fully wireless and a semi-wireless dog fence is that a semi-wireless fence comes with electrical wiring that you have to set up yourself. A fully wireless dog fence will work better for you if you don’t really want to dig around in your yard. All you have to do is place the transmitter, activate the receiver, and set the radius of the containment area. 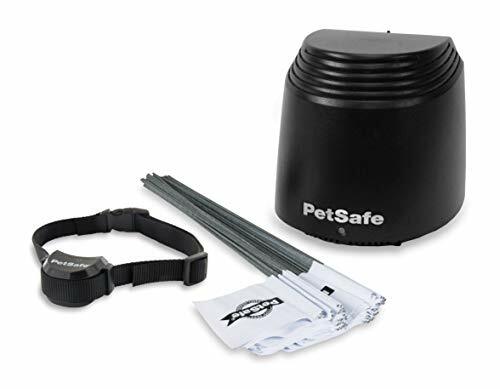 This dog fence is also easier to take with you on camping trips, so you can keep your dog safe even if you’re traveling. If your yard has a more unusual layout, though, a semi-wireless dog fence might be what you need. You’ll have more freedom to customize the layout of the containment area when you’re laying down the electrical wiring yourself. This electric dog fence is also ideal if you want to keep your dog contained within a larger acreage. Given the popularity of these fencing systems, you may find it difficult to make the right choice. Here are the top 4 factors to keep in mind when you’re looking for the right wireless dog fence for your needs. The best wireless dog fence for you greatly depends on the kind of backyard you have. Most electric dog fences work best in open spaces where radio signals can travel straight from the transmitter to the receiver. If you have a medium-size yard that’s in the traditional rectangular shape, a fully wireless dog fence might be the ideal setup for you. A semi-wireless dog fence might be the best choice for yards that are irregularly shaped, as you’ll be able to customize the layout of the containment area. Another important consideration in choosing an electric fence is your dog himself. Large dogs will do just fine with the default level of static correction from the collar, but smaller dogs may be more comfortable with a wireless dog fence that can provide a lower level of correction. You also want to consider your pet’s age when you’re looking for the best wireless dog fence. The best age to introduce your puppy to an electric fence is at 4 to 6 months. At this age, your pup has most likely gotten over the fear of unfamiliar objects and is ready for learning commands such as ‘sit’ and ‘stay’. Once he has learned to follow these commands, you can start training him for the wireless fence. If you have more than one canine pal at home, then you want to look for a wireless dog fence for multiple dogs. These fencing systems often come with enough collars so you can use the wireless dog fence for 2 or 3 dogs, if needed. Some invisible dog fences also allow you to purchase additional collars for use with the system. Wireless dog fence systems can also come with plenty of bells and whistles for more convenient use. More advanced wireless dog fences come with GPS for tracking your pet’s exact coordinates, so your dog gets static correction in a more timely manner. Other wireless dog fences also have waterproof receivers. This way, you can keep your dog safe even if he’s playing in the snow or rain or going for a swim. Many fully wireless dog fences are adjustable, so you can set the radius of the containment area as needed. To make shopping easier for you, we’ve narrowed it down to 10 of what we think are the best wireless dog fences (fully wireless and semi-wireless) for 2019. 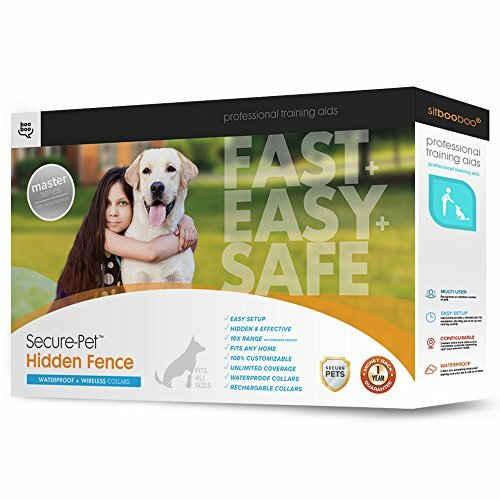 If you’re looking for the best wireless dog fence that can cover your sprawling property and contain your energetic dog, we think this is the best choice for you. The fencing system allows you plenty of customization. You can set a boundary zone anywhere from a few inches to up to 32 feet in diameter. You can choose between two frequencies for the transmitter to avoid interference with other electrical devices, like your neighbor’s invisible dog fence. The transmitter’s electronics will also compensate for colder temperatures or fluctuating power to stabilize the fence’s performance. One of the best features of this wireless fencing system is the submersible collar. Your dog can go for a dip in the pool without affecting the collar’s functions. 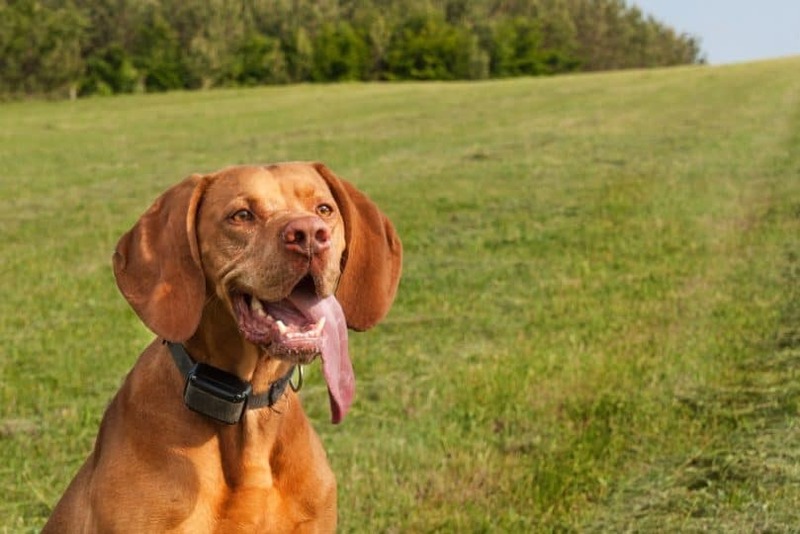 Contact covers and two different sizes of contact points ensure that, whether he has long or short neck hair, the collar won’t irritate your dog. The collar offers 8 correction levels, so you can lower or raise the level according to your pet’s behavior. It’s also lightweight and adjustable, so it will fit dogs as small as 8 pounds. The heavy-gauge wiring included in the kit is rated for direct ground burial, so you can expect it to last through years of exposure to the elements. For pricing and availability, click here. This fully wireless pet containment system is an excellent option if you don’t want to deal with digging up trenches and burying wires in the ground. You can get this electric dog fence running in a couple of hours. Through a dial on the transmitter, you can choose the size of the containment area and the boundary zone, which you can adjust up to 90 feet in all directions. 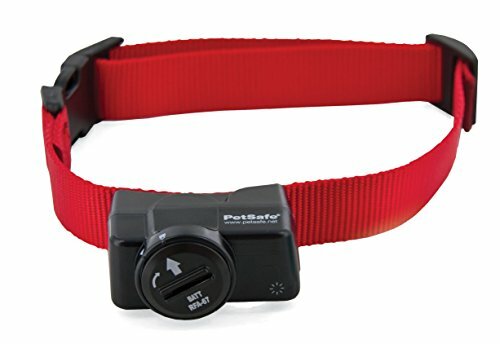 The receiver on the collar is adjustable, which makes it easier for you to set an appropriate correction level for your dog’s size and behavior. The tone-only mode comes in handy for training your pet to back off once he hears the beep. For your convenience, the collar also has a low-battery indicator. You’ll know exactly when the receiver needs fresh batteries. This might be the best wireless dog fence for you if your dog is particularly insistent about leaving your backyard. The highest intensity level of static correction may work at catching the escape artist’s attention and making him retreat. With these levels of correction, this invisible fence system is more suitable for use with dogs weighing more than 30 pounds. The fence is a good choice if you have, for instance, an especially curious Alaskan Malamute who can’t resist the squirrels around your property. The vibration warning provided by the collar, along with the marker flags, also works great at teaching hearing-impaired dogs to respect the boundaries of the containment area. 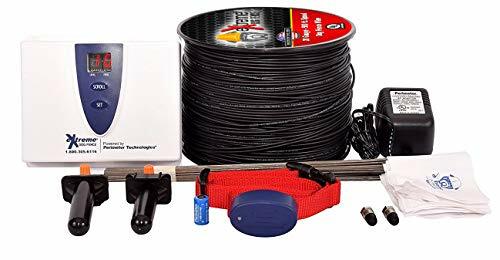 What makes this Max-Grade Electric Dog Fence system unique is its 14-gauge wiring, which comes with a heavy-duty polyethylene coating. The coating makes the wire durable against harsh weather, so you can keep the wire above ground. According to the manufacturer, the wiring can also last for up to 25 years thanks to its thick jacket. 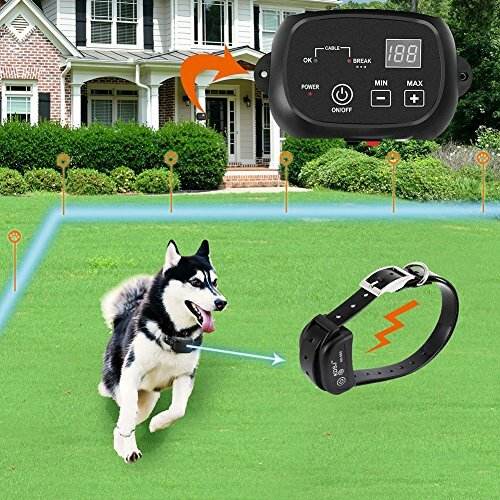 Another great feature of this wireless dog fence is the Progressive setting on the collar. On this setting, the static correction increases in intensity as the dog moves closer to the boundary line. This may come in handy if your furry, four-legged pal tends to be a little stubborn. This wireless dog fence system doesn’t have wires that you have to place in the ground, so it’s easier to pack up and bring along when you’re traveling with your dog. The system offers 5 levels of static correction, which come in 15-second bursts. The tone-only mode can help you train your dog to respect the boundary lines. The collar is also highly adjustable and can be used with dogs 5 pounds and up. You’ll be able to use this fully wireless dog fence even with large dogs, as the collar will fit necks up to 23 inches in size. The collar’s battery is rechargeable, too. The battery takes around 3 hours to fully charge and can last through 3 weeks of use on one charge. This semi-wireless system is the best wireless dog fence for your home if you want to customize the design of the containment area. We found that you can use the wiring to create more than one containment area in the backyard. The transmitter features a dial for adjusting the level of static correction from the collar. Together with fence’s updated copper wire, radio signals are stronger and more reliable. The collar’s rechargeable battery can last approximately one week on a full charge. A blue LED flashes to let you know that the battery is fully charged. This is another semi wireless fence that’s best for stubborn or strong dogs. The ‘Speed Detection’ function on the collar raises the level of static correction as your dog runs faster towards the boundary lines. The increasing shock intensity may be effective at stopping your pet in its tracks. The system comes with 2 collars, both of which are rechargeable and waterproof, with an IP66 rating. The collars can also fit dogs weighing up to 120 pounds, so they’re perfect if you’re the owner of a giant breed. With 1,000 feet of wiring, this is one of the best wireless dog fences for larger properties. You can expand the coverage from 1 ⅓ acres to 100 acres by connecting more wiring to the transmitter. The collar offer 4 levels of static correction plus a handy anti-linger feature. The anti-linger feature provides static correction if your dog stands too long in the warning zone (where only the tone and vibration is usually triggered), encouraging him to move away from the area. Built-in lightning protection ensures that the entire electric dog fence system, and your home, is protected from power surges. Wire break alarms will also sound off if the wiring is somehow cut underground. If you want to be able to customize the zones where your dog gets the warning tone and static correction, we think this may be the best wireless dog fence for you. This adjustable feature comes in handy if you want to give your pet more leeway as he’s adjusting to the wireless fence. Eight levels of static correction also allow you to fine-tune the correction’s intensity level so it’s more suited to your dog’s temperament. The higher levels may be more ideal for stubborn canines. Two pairs of contact points also ensure that your pet pooch can comfortably wear the collar, whether he has short or a long coat. One unique feature of this wireless dog fence system is that it comes with a remote control, which you can use to manually activate static correction from the collars. This makes it significantly easier for you to train your dogs not to cross the fence’s boundary lines. The remote control offers 10 levels of vibration and static correction. When used with the electric fence, the collars provide 3 levels of automatic static correction. The collars are also designed to comfortably fit most dogs, even those weighing up to 154 lbs and with neck sizes of 27 inches. This is a great option if you own large dogs. The effectiveness of an electric dog fence largely depends on the training you give your dog prior to the fence’s activation. It’s crucial that your dog learns to back off once he approaches the boundaries of the containment area. Your first priority when training your dog for a wireless fence is to get him familiar with the boundary flags and the warning sound the collar makes. With the collar’s static correction level set to ‘tone only’, walk your leashed dog to the flags or the boundary zone. Once the collar begins to beep, allow your pet stay in the zone for up to two seconds before moving him back to the safe zone. Give your dog a treat once he’s out of the boundary zone, so he acknowledges retreating with something positive. Eventually, your pet will start resisting going into the boundary zone (this may take a few days). Once that happens, repeat all these steps with static correction activated. Increase the correction by one level until your dog responds and refuses to go near the flags. Keep your training sessions short and fun. This way, the process is as stress-free as possible for your pet pooch. Use distractions, like his favorite treats and toys, to try to get your dog into the boundary zone. If he ignores all these distractions and chooses to stay in the safe zone, your pet is ready to be unleashed around the activated wireless fence. 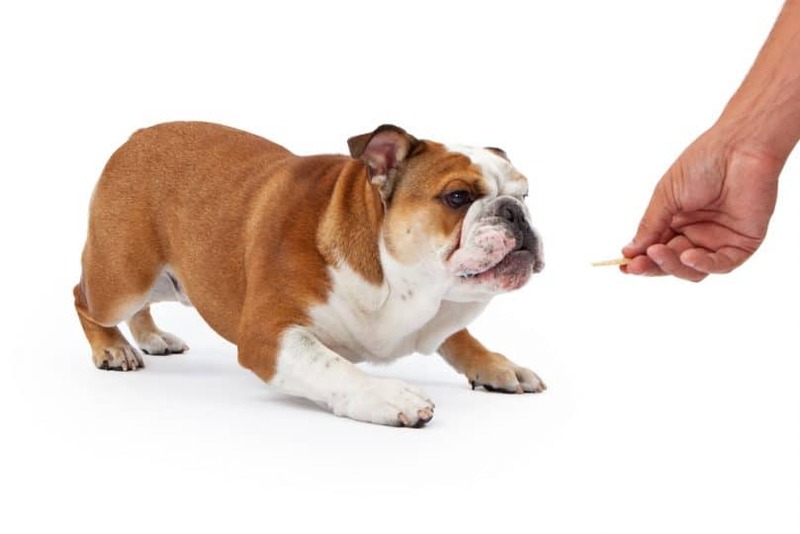 Give your pet plenty of treats and praise each time he retreats into the safe zone, with or without your help. 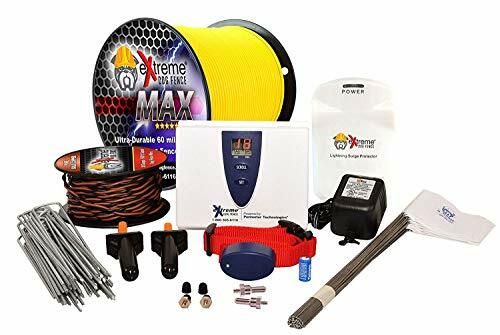 The Extreme Dog Fence Second Generation (2019) Single-Dog Standard-Grade Kit is our favorite among all the fully wireless and semi-wireless dog fences we reviewed. The adjustability of the transmitter’s frequency and the boundary zone’s size definitely make the fence more efficient. The Extreme Dog Standard-Grade fence is a good choice for small breeds like the Yorkie and the Chihuahua. The collar receiver has a lightweight design that will fit dogs as tiny as 8 pounds. 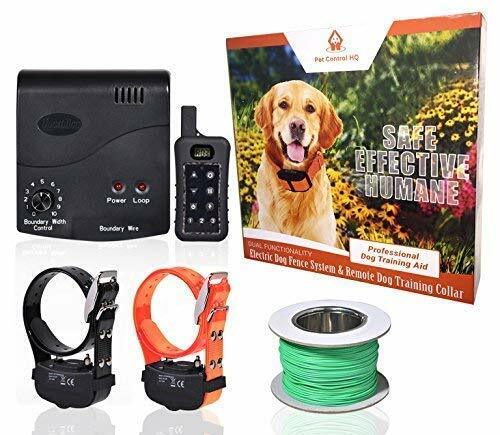 The PetControlHQ Wireless Combo Electric Dog Fence System with Remote Control comes with a collar that can fit dogs weighing up to 154 pounds, making it the best wireless fence for large, strong breeds such as German Shepherds and Siberian Huskies. 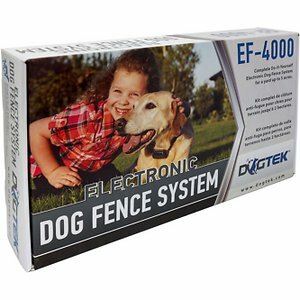 Of course, the best wireless dog fence is the system that best suits your backyard and your dog. If you have a medium-sized, wide-open yard with few obstructions, a fully wireless dog fence like the PetSafe Wireless Fence Pet Containment System will work best at keeping your dog contained in a safe area. If you have an irregularly shaped yard or if you have a larger property, you want to go for a semi-wireless fencing system. 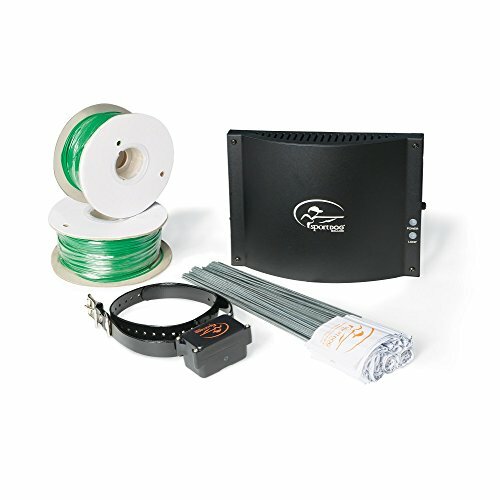 The SportDOG Brand In-Ground Fence System, for instance, comes with 1,000 feet of wiring that will let you create a variety of customized containment areas. Is Rover.com the Best Dog Sitting Website?